Today I traveled over to the Nasher Museum of Art to install an item from the Rubenstein Library for the upcoming Portrait of Venice exhibit. 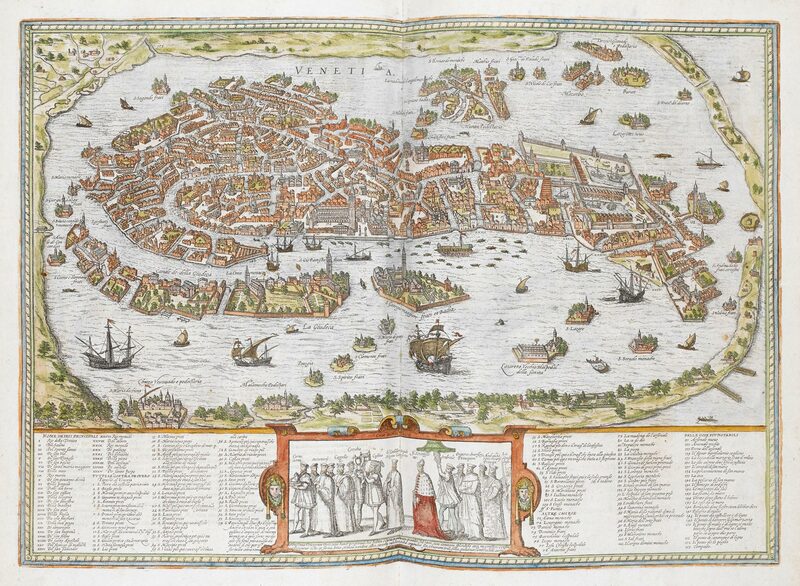 A hand-colored map of Venice from Georg Braun‘s 1572 edition of Civitates Orbis Terrarum (below) will be on display alongside the mural-sized woodblock print by Jacopo de’ Barbari. Map of Venice from Civitates Orbis Terrarum. The Nasher exhibit runs from September 7th until the end of this year. If you did not have a chance to see the Barbari print during the Glory of Venice show at NCMA, this is another good opportunity. The sheer size and detail of the piece is just incredible. The exhibit will also feature interactive multi-media displays produced through multi-disciplinary and collaborative research at the Wired! Lab at Duke. 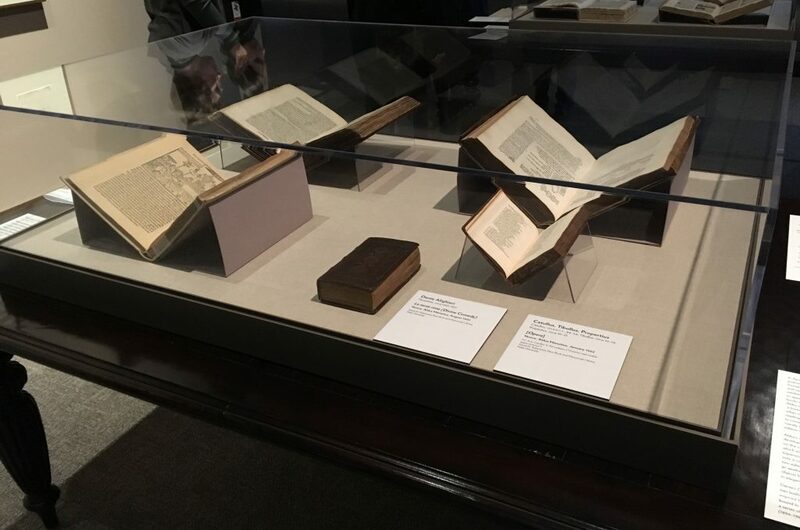 Our new exhibit focuses on how a book is made “from the ground up.” In the exhibit you will see examples of binding structures dating from the 4th Century C.E. to the 21st Century C.E. 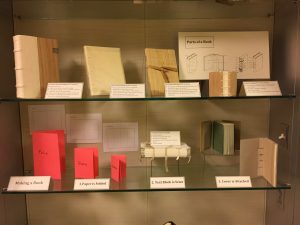 Also in the display is a selection of tools used by bookbinders, and an overview of how a book is made. The exhibit is open during regular library hours. It is located on the first lower level of Perkins Library, just outside the Verne and Tanya Roberts Conservation Lab (Perkins Library 023). Please stop by and let us know what you think. … is (often) paved with good intentions. 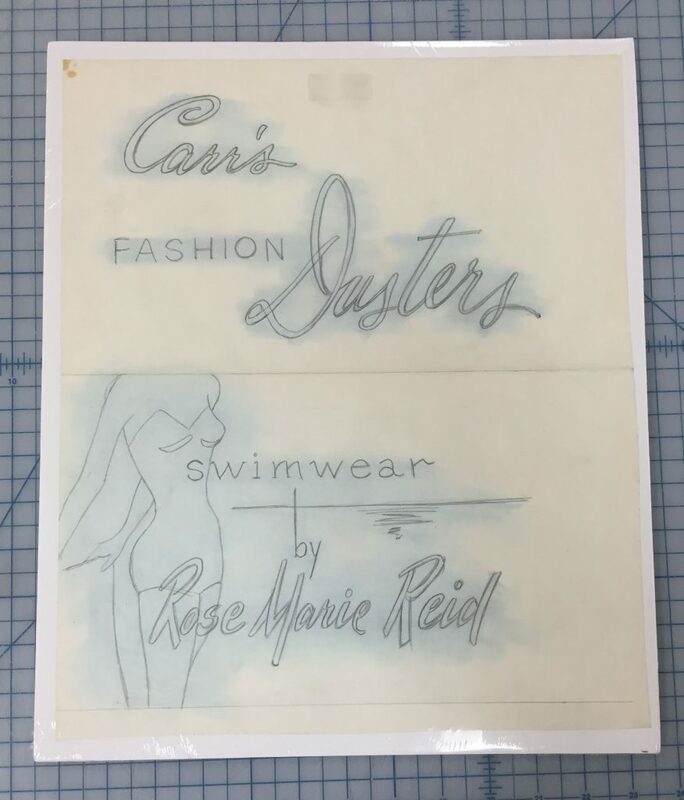 Last year the John W. Hartman Center for Sales, Advertising & Marketing History acquired a small collection of fashion design drawings from the 1940s and 50s by Vivian Gauld. Gauld was West Coast-based commercial artist whose drawings were used in retail advertising campaigns for companies like Rose Marie Reid, Jantzen, and Carr’s Fashions. Some of the drawings are currently on display in the Michael and Karen Stone Family Gallery, highlighting recent acquisitions to the collection. 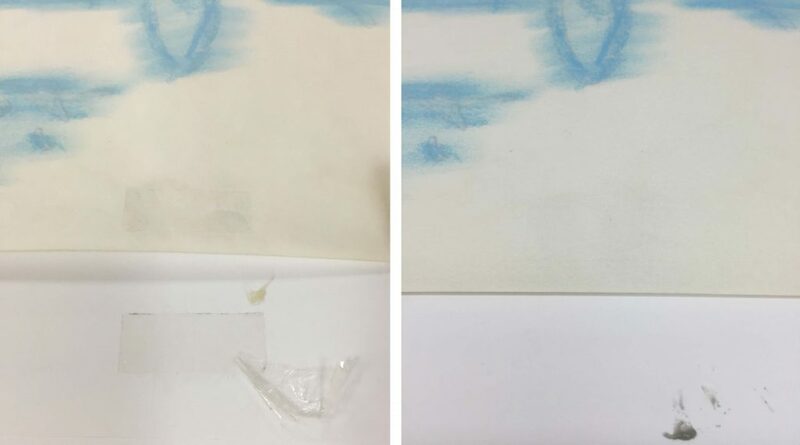 Before coming to Duke, each drawing had been mounted to foam-core board with double-sided tape and then shrink-wrapped. I can see why this packaging method was done. While it does reduce the risk of mechanical damage from handling and shipping, the tape and sealed package are not the most stable environment for long-term storage. Curators and conservators always assess items with our Exhibitions Coordinator before they go on display. Because the items going on exhibit needed to come out of their shrink wrap anyway, the team made the decision to rehouse the whole collection. I was able to carefully cut and remove the shrink wrap from each package. The few drawings with friable media (like pastel or charcoal) actually have it applied to the back of the thin drawing paper, so there was little risk of disruption from the static charge of the plastic film. 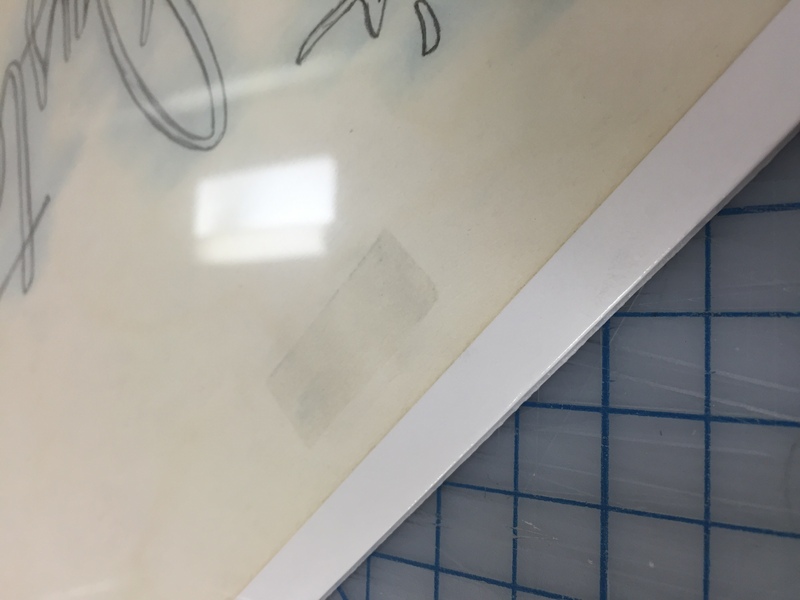 I was able to separate each drawing from the backing board by heating a very thin metal spatula with a hot air pencil and passing it between the drawing and the tape carrier, however, residual adhesive still remained on the verso of the drawing and needed to be removed prior to rehousing (image below, left). The double-sided tape appears to have been applied fairly recently and had not yet penetrated the paper or crosslinked. 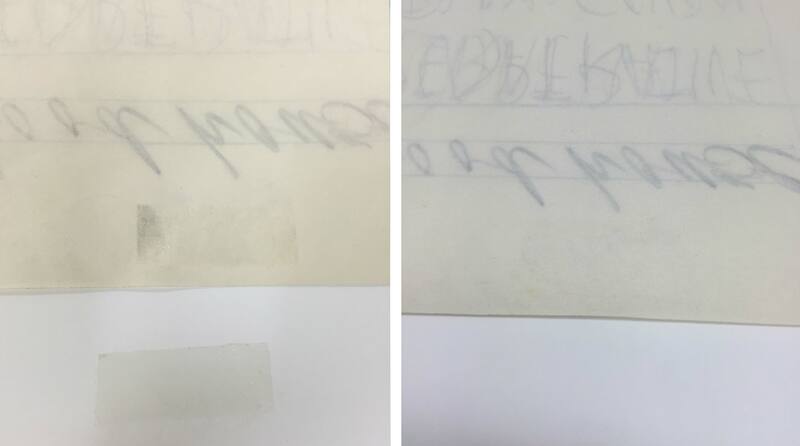 I was able to remove it without disturbing the paper fibers by gently rolling the adhesive off with a crepe eraser (image above, right). These drawings will now be stored in either clear polyester L-sleeves or paper folders, depending upon the drawing media. The collection had been placed into two metal edge boxes, but removing the foam-core backing has significantly reduced the required storage space. We can now fit them all into one box. 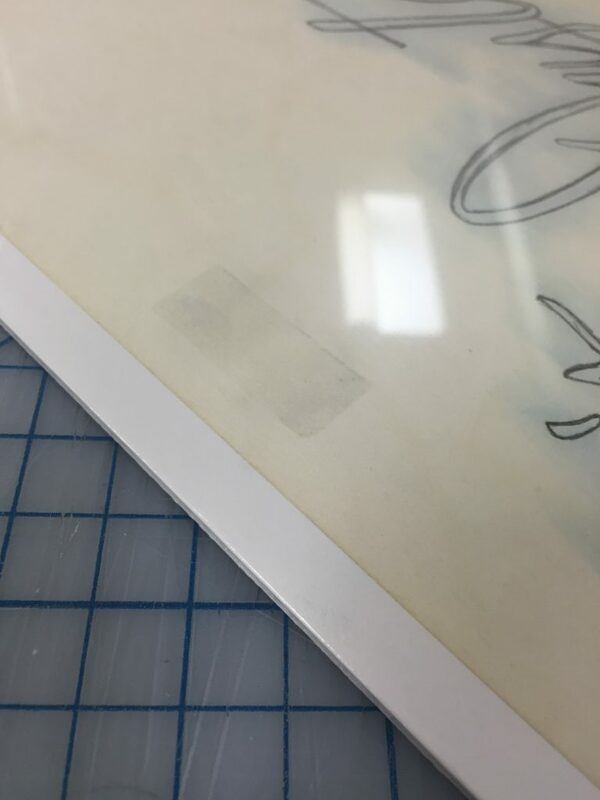 While the shrink wrap package probably seemed like a good idea at the time, I am glad we were able to rehouse the drawings before they were visibly affected by it. It’s hard to say what a typical day in the conservation lab might be, or what skills you will need when you show up for work in the morning. 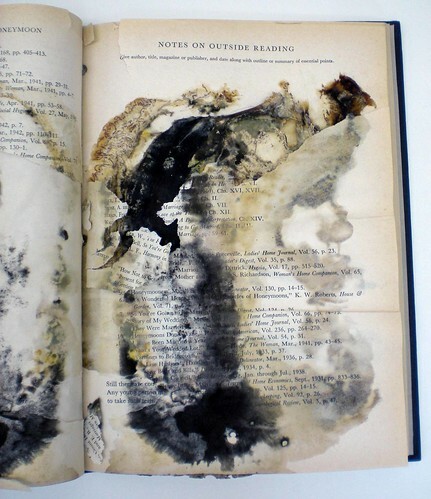 What makes library conservation challenging is that you need to know about not only books and paper objects, but paintings, art on paper, furniture, sculpture, indigenous and folk art, photographs, analog and digital A-V materials, media of all kind from the dawn of mark-making, etc. 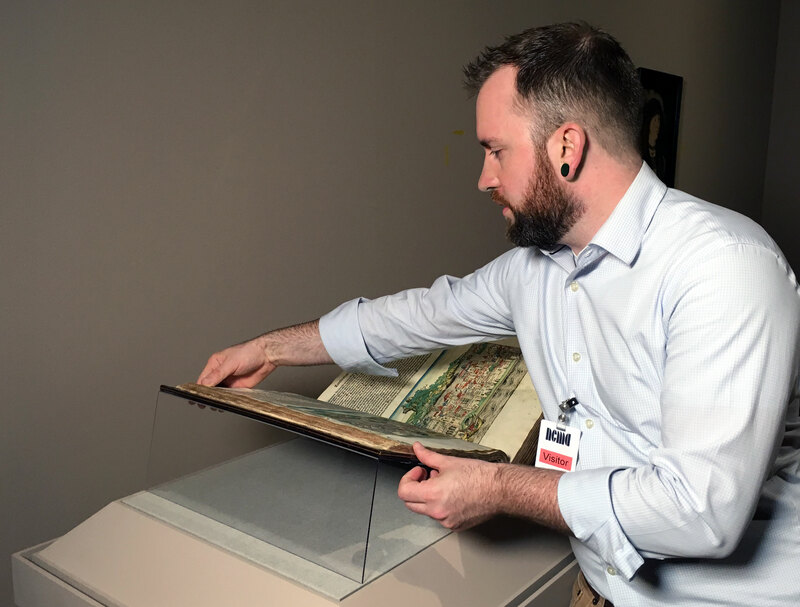 The list of what we need to know is endless because libraries and archives collect broadly, and the conservation needs of these collections can be complex. This list doesn’t even cover the parts of library conservation that include budgeting, planning, managing people, environmental monitoring, attending meetings, and all those things that keep the Conservation program running smoothly. Yesterday I was reflecting on the life of a collections conservator as were doing some out-of-the-ordinary work. I was asked to write condition reports for the three portraits in the exhibits suite. I’m not a paintings conservator, but I do know how to look at an object and describe its condition in enough detail that someone can understand the state of that object now, and determine if any changes occurred in the future. I found the Canadian Conservation Institute’s excellent reference materials online regarding evaluating paintings to be very helpful in my evaluation. I have also collected condition data on the two historic pieces of furniture in that room. I didn’t find a CCI document on writing condition reports for furniture, but they do make available a lot of furniture care and handling information. We have no paintings or furniture conservators on staff, but my skills are such that I can describe them for our records and help facilitate their conservation should the need arise. 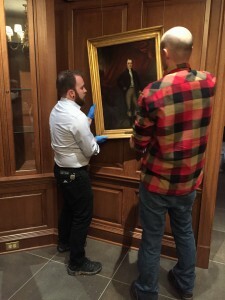 When they were ready to go back on the wall, Henry Hebert from Conservation, and Ben Bridgers from Exhibits, rehung the portraits. Hanging Mrs. Mary Duke Biddle’s portrait. 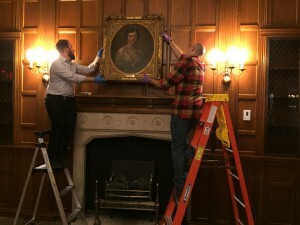 Once the portraits were hung, Henry and Ben, with Val Gillispie, Duke University Archivist, helped reposition the Virginia Woof desk in the Michael and Karen Stone Family Gallery. 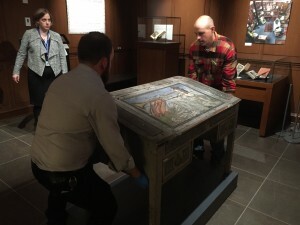 The desk is part of the newly acquired Lisa Unger Baskin Collection and is now on display as part of the “Heralding The Way to a New World” exhibit. The final thing to do was to help get the lighting levels adjusted for the desk. Repositioning the Virginia Woolf desk. This morning, we helped put the book collections on the shelves that line the exhibits suite. It took about an hour and a half and eight people to finish the job. The exhibits suite is now ready for the weekend’s events. 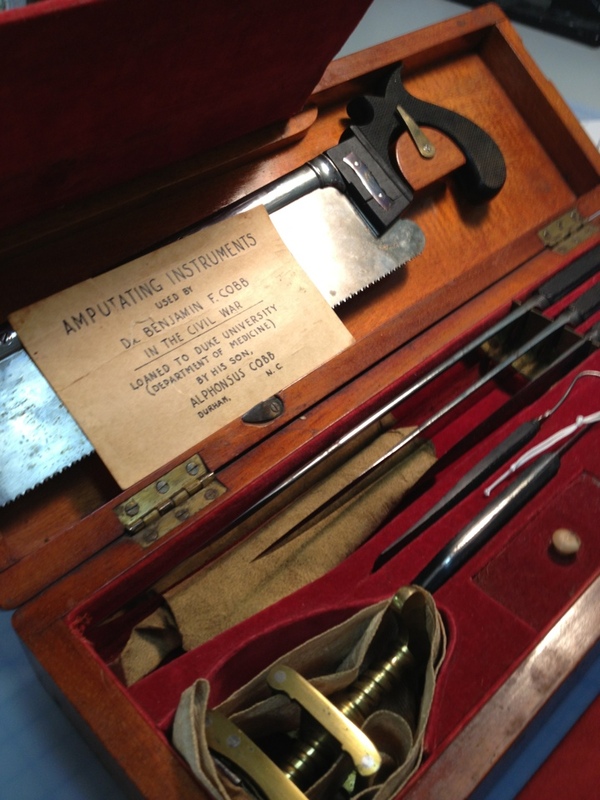 While this is a fascinating piece from our History of Medicine Collection, it does make me very happy to be living in an era of modern medicine (e.g. anesthesia). This is in the lab for evaluation prior to being loaned for an exhibit at the Duke Medical Center Library. It’s an amazing thing to contemplate. 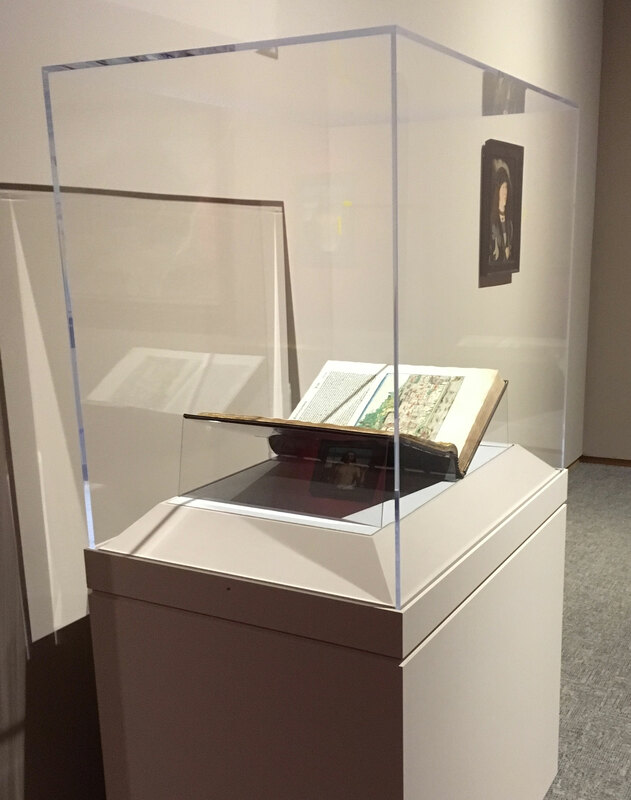 The banana book makes its first public appearance in our new exhibit. Don’t miss it! “Help Wanted: You Can Help Keep Our Collections In Good Condition” focuses on what our patrons can do to keep our books on the shelf and usable for everyone. The exhibit is intended to support reinforce the information we present at our annual Care and Handling training, which will be scheduled for late September or early October. The exhibit is open during regular library hours. It is located just outside the Conservation Lab, Room 023, Perkins Lower Level 1. Come see the banana book in person. There is another little surprise in there, too. New Exhibit: What’s missing from your video history? Written by Liz Milewicz, Ph.D, Head of Digital Scholarship and Production Services. Exhibit curated by Liz Milewicz and Winston Atkins, Preservation Officer. Calling up my favorite Bert and Ernie sketches on YouTube makes it seem like there’s no problem with accessing my video history. But a brief glance behind the institutional curtains of digital preservation casts a cloud on how often I’ll be able to revisit such happy scenes. “Generation Loss,” a new exhibit that I’ve co-curated with Winston Atkins, Preservation Officer, presents just a few of the many videotape formats introduced during the 20th century and collected in Duke University Libraries, as well as the signs of their deterioration and the factors that contribute to their loss. Because some of these signs are only visible when the tape is played, much of this loss goes unseen and unknown until someone tries to play the tape. 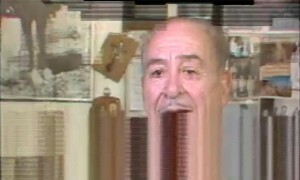 The video display in this exhibit demonstrates some of common signs of audio-visual deterioration. 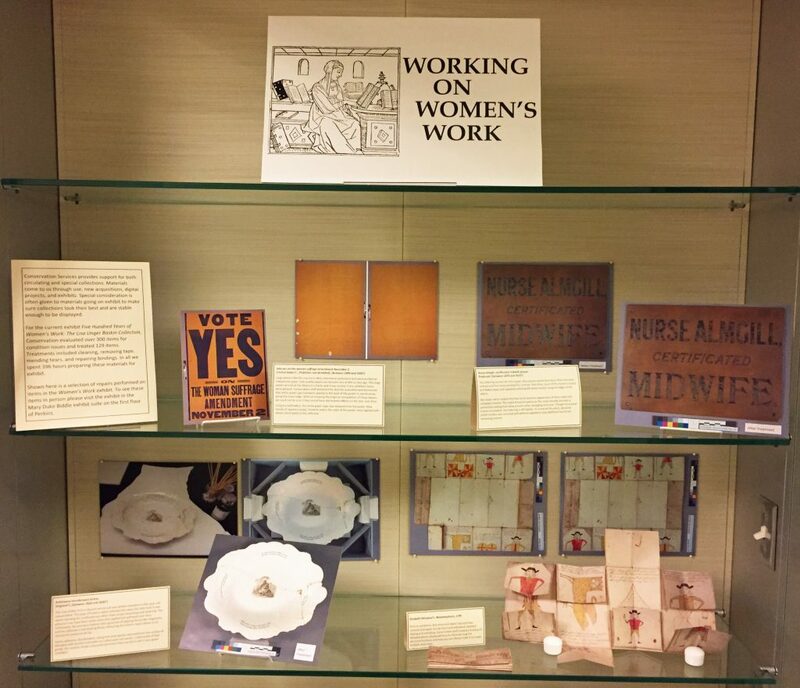 The exhibit is open during regular Perkins/Bostock hours. We are located on the Lower Level (same level as the Link), by Perkins Room 023. Come and have a look!